For more than thirty years, Claude Gaspari (b.1936), was the official photographer of the greatest painters and sculptors of the twentieth century (Calder, Miró, Giacometti …). His exhibitions take us to a poetic journey in an undefined place revealed by his sensitive eye. Master in the art of using imagination without ever altering reality, Gaspari transcends reality and reveals a fluctuous relationship between man and his environment. Claude Gaspari is a French photographer born September 30, 1936. He lives and works in the Paris region. In the 1950s, he began his career as a photo reporter, specializing in entertainment, music-hall, cinema, sport, exhibitions, paintings and sculptures. From 1961 to 1982 he was director of photography at the Galerie Aimé MAEGHT, Éditions MAEGHT Paris and the MAEGHT Foundation in Saint-Paul de Vence. He made photographs and films on the artists Braque, Calder, Chagall, Giacometti, Malraux, Miro, de Stael, etc. From 1984 to 1996, he devoted himself to art photography for museums, galleries and foundations, magazines, television such as The Louvre, Georges Pompidou, Orsay, Matisse, Jeu de Paume, Lille and Mac Val. Great artists from the 20th Century asked him to photograph their artworks: Bram Van Velde, Calder, Cesar, Chagall, Jansem, Klasen, Matisse, Miro, Soulages, among others. In parallel, he was, from 1988 to 2001, the photographer of the TV series on the masters of painting “PALETTES” produced by and broadcasted on ARTE TV Channel. In 1999, he was appointed to the rank of French Knight of the Arts and Literature Order. 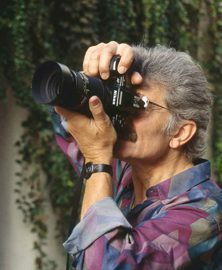 Claude Gaspari’s personal photographic work was exhibited for the first time in a group exhibition at the Fondation Cartier, Paris in 1989. Since 1990, he has been represented by Jany Jansem who has regularly exhibited his works at Galerie 10, then at Galerie Matignon, Paris , and at art fairs in France, in the United States.